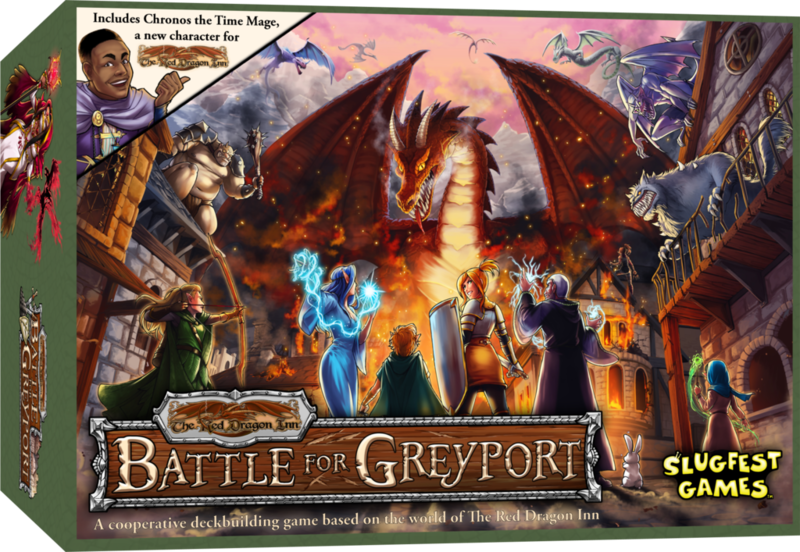 The Red Dragon Inn: Battle for Greyport is a game by Nate Heiss, Sam Waller and Jeff Morrow, published by Slugfest Games. It is for 2-5 players. In this game, players take on the role of one of the famous adventurers from Red Dragon Inn fame. They’ll be tasked with defending the city from a bunch of rampaging monsters of every shape, size and color, as well as some extremely nasty bosses. They’ll have to work together if they hope to defeat the onslaught of creatures. In the end, they’ll either win together or suffer crushing defeat as the monsters destroy the city. If all the monsters and the boss are defeated, the heroes will be declared the winners. To begin, players should choose a scenario from the many different scenario cards. For first time players it’s recommended to use The Interrupted Party scenario. The scenario card is set aside along with the corresponding encounter cards, locations, monster decks and boss monster as noted on the scenario card. Players now choose a character and are given the character’s 9 card starting deck, 3 player hero cards and deck divider which has a round order chart on the back. Players shuffle their starting deck and draw 5 cards from it. They then add their level 1 player hero card to their hand. The level 2 and 3 player hero cards are set aside to be used later in the game. Players are given 10 hit point tokens unless the scenario card states otherwise. The hero deck is shuffled and the top 4 cards are revealed and placed in a face up row beside the deck. If any gold cost cards are revealed, they are set aside and a new card is revealed to take it’s place. Once there are 4 non gold cards in the row, any revealed gold cards are then shuffled back into the deck. The same thing is then done for the item deck with 4 non gold cards needing to be revealed. The starting player is chosen and is given the round marker with the “Taunt” side face up. Next the Encounter is setup. For the Encounter setup, the appropriate encounter card is placed in the center of the table along with the corresponding location card which is placed beside it. The players use the setup column on the encounter card that matches the amount of players. The players shuffles the monster deck that matches the encounter card into the current monster deck. At the beginning of the game there is no current monster deck so there should only be one set of monster cards used. The location card is then given the matching amount of hit points as noted on the encounter card. A number of monster cards are then revealed next to the location until the accumulated threat levels of the monsters meet or exceed the number indicated on the encounter card. Beginning with the starting player, monsters are then revealed for each player in much the same way as the location until the threat level meets or exceeds the number on the encounter card. Players then check the encounter card’s setup and follow any special setup procedures listed there. If there is a boss monster listed, the boss card that matches the one listed is placed on the table along with the matching boss HP token. Each player is then given a certain number of recruitment coins as listed on the encounter card. Players then check the monsters in front of themselves and resolve any ambush effects in the order of their choosing. The location card is then placed on top of the encounter card with only the penalty showing at the bottom of the card. Play now begins. The game is played over a series of rounds. Each round the starting player with the round marker is known as the defending player. The monsters in front of that player are the active monster group. Each player is able to play cards to help save the defending player and the location. Each round players are allowed to take a series of actions in any order. They can play 1 hero card, they can play 1 item card onto a matching hero, they can fight an active monster and they can use the round marker to taunt a monster if they are the defending player. Playing a hero card is done by simple placing the card face up on the table. Item cards when played are placed on top of a chosen hero so that it partially overlaps. Any card that has a downward arrow icon resolves the effect before taking any further actions. Cards with a right arrow pointing to a line can choose to use that ability once that round. Crossed sword icons on a card indicate that the action resolves when the hero fights a monster. Speaking of fighting monsters, when a player choose to fight a monster they will first turn the hero sideways to show that it has been used that round. Next an active monster is chosen to fight. If there are no active monsters a location monster may be fought instead. Any dice that must be rolled due to card abilities are then rolled. The attack then does the accumulated damage of card numbers, dice rolls or both. Damage markers are then placed on the monster. If it takes more damage than it’s health, it’s defeated and the card is discarded. If all the monsters in play are defeated, play proceeds to the encounter cleanup. We’ll discuss that in a moment. It should be noted that some cards and the round marker have the taunt ability. What this means is that when this ability is used the player is allowed to take a monster that is not in their monster group and move it to their monster group. That monster can be from the location or another player’s monster group. If the round marker’s taunt ability is used, the marker is flipped over to indicate that it’s been used that round. The round marker is only usable by the defending player. Taunting is a great way to save the location, especially if it’s running low on hit points. As soon as there are no more monsters on the location, either due to them being taunted away or being defeated, players gain the location reward. However that’s only if the location is still active because it has 1 or more hit points remaining. Once the players either can not or choose not to take any more actions, there are a series of 6 steps that must be taken in order to end the round. First there’s monster damage. In this step any active monsters and the location monsters deal damage, beginning with the defending player. If that player’s hit point level is reduced to 0 or below, the players lose the game. As long as the player still has hit points, damage is then allocated to the location from the location monster group. If it is reduced to 0 or lower hit points, it’s destroyed and the players suffer the penalty at the bottom of the encounter card. If there are any bosses on the location, they then move to the active monster group. Players then take turns taking one of the monsters from the location group and adding it to their monster group. The location card is then discarded. The next step is cleanup. In this step, any player that played a card with the cleanup icon on it, now resolves the cleanup effect. Players then discard any and all cards that they played during the round as well as any unused shield tokens. The next step is the recruit step. In this step, the defending player must spend a recruitment coin to recruit a card from the reinforcement decks, if they have any coins. Recruited cards are placed in the player’s hand not in their discard pile. The purchased card is then replaced from the appropriate deck. The fourth step is the discard step. In this step, the defending player sets aside their player hero and then discards down to their hand size. They may choose to discard any additional cards that they would like to. The next step is the refill step. In this step, the defending player now draws back up to their hand size and returns their player hero to their hand. The final step is to pass the round marker. In this step, the defending player passes the round marker to the player on their left. That player then places it with the “Taunt” side face up in front of them. Any monsters that have the ferocious ability are then moved to the new defending player’s monster group. Earlier I mentioned the encounter cleanup. This happens when all the monsters in play are defeated. At this point, there is an immediate cleanup step which is the same as the clean up step described above. Next players, in order, must spend all of their remaining recruitment coins to recruit cards from the reinforcement decks. Once this has been completed, all players follow the discard and refill steps described above. After this has been completed, play proceed to the encounter setup for the next encounter as described earlier. The game continues with players fighting monsters, recruiting heroes and purchasing items to fight with. Each encounter has a specific win and lose condition. Most of the time this will entail defeating the boss and not letting any of the heroes die. If the players are able to complete the win condition, they will be the winners. This game has some amazing looking pieces to it. Anyone familiar with the Red Dragon Inn series of games will recognize many of the player heroes. The same type and style of artwork is present on every card and every token that comes with the game. There’s a ton of different cards that are packed inside the box, over 350 cards. There are monster cards of 6 different subgroups. There are monster token cards for bringing in some extra little nasties, much like the token cards in Magic the Gathering. There are hero and item cards that make up the 2 reinforcement decks. Each starting hero has their own personal starting deck of cards. There are also curse cards which I didn’t mention in the overview but that simply clog up your deck. If that’s not enough there are also the oversized cards like the 5 different player hero cards, including the new Time Mage, Chronos. Speaking of Chronos, the game also comes with an entire ally pack for him including promo drink card, character deck, gold and platinum coins, alcohol content marker, fortitude marker, player mat and deck divider for use with the Red Dragon Inn series of games. Back to the oversized cards, there are the different location cards as well as scenario, encounters and boss monsters. There are several different colored dice included as well as a whole bunch of tokens. There are tokens for damage, hit points, recruitment coins, shield tokens, boss monster hit points and the round marker. The game also comes with some cardboard dividers to keep everything separated inside the box and for ease of setup. On the backs of these are are quick reminder of a player’s actions. Kind of a little cheat sheet player reference. Like I said, there’s a lot of stuff inside this box. The thing is that the artwork and designs are beautiful. I absolutely love the look and feel. There’s absolutely nothing that I’d change component wise. If you’re not a fan of Red Dragon Inn, then you might not like this one. For me though, I love it. The rulebook for this game is excellent. There are plenty of pictures and examples throughout the book. The book starts with some great overviews of the different card types and what each part of the card is and what it does. This includes the larger cards like the locations and boss monster cards as well. From there it explains the different tokens before moving into describing how to setup the game using the scenario cards. A couple of pages later and there’s a great full color page of what the game should look like setup. Next the book explains all the basics of playing the game with plenty of details. Afterwards the abilities of the different monster and heroes are explained in detail along with some card specific notes. The last couple of pages include several variants to change up how the game is played. Finally on the back cover is a check list for achievements that lists all the different scenarios and allows you to check off in order when you beat them. Overall I like the look and feel of the book. Everything is laid out really well and includes all the pertinent information along with some great details for clarification. I’m thrilled with the book and think that it gets the job done in excellent fashion. Let me say straight up. This game can be very hard to play. I’ve played through the introductory scenario several times and found it to be quite difficult. The next scenario isn’t quite as bad. Not sure why the intro one was setup to be so difficult. Maybe it’s that you start off with less health than in other scenarios. That’s my thought on it anyway. In any event, it’s no surprise that I love deck builders. However, this one doesn’t have a lot of the normal deck building aspects that you’d expect. When I think of a deck building game, I think of Ascension or Dominion. In those games you play cards and buy new ones to add to your deck. Plain and simple. In this game, you’re playing hero cards and then playing items on them to help you attack or move monsters around the play area. It’s not until the the round is ended that you can actually acquire new cards and then it’s only the defending player that can do that. Not only that but usually you add up the coins or currency of some sort and can purchase stronger cards. With this one, if you only have a bunch of copper coins, too bad about buying that gold cost item or hero. I’m not a big fan of that aspect of the game. To me there should be a currency exchange rate or something. Maybe if 3 copper make a silver and 2 silver make a gold. I’m just spitballing ideas at this point. Apart from that and the painfully difficult gameplay, I actually like the game. I like how that saving the locations can actually provide you with special benefits that can really help you out. I also like that the game comes with 7 scenarios. I’ve played the game several times and have yet to make it to the harder difficulty ones. I can only imagine that things are gonna be nigh impossible. Fans of the Red Dragon Inn series will most likely like this one, especially since it adds a new character to be used in those games. Fans of deck building games might enjoy a new challenge and a new style of playing. For me, I would recommend giving it a try. It might not be for everyone as the difficulty of the introductory scenario might scare players off. I think if you go into it with an open mind and keep at it, you just might like it like I do. 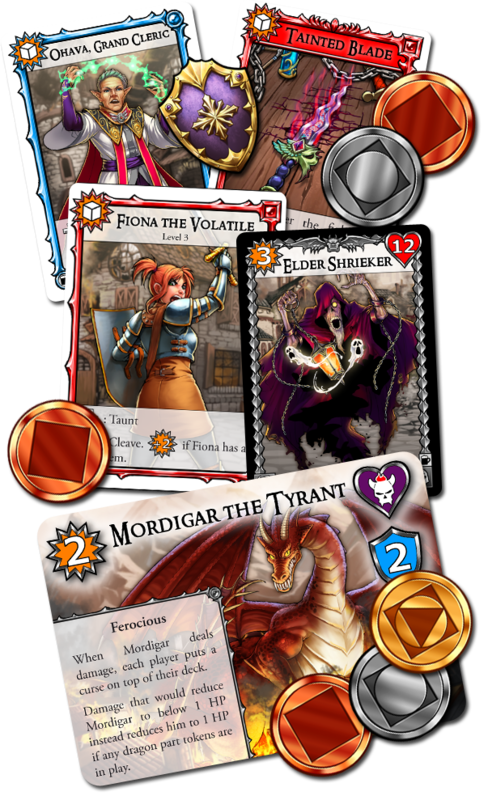 The Red Dragon Inn: Battle for Greyport is a cooperative deck building game set in the Red Dragon Inn universe. The game is fairly average in play time. Most game sessions last around an hour to an hour and a half. The game looks great. There are lots of great looking cards with a very similar style artwork to that in the Red Dragon Inn series of games. I really like the look and feel of the game as well as the durability of the cards. The rulebook is also great and has lots of great information that is easy to find what you’re looking for. I especially like that there are achievements as well as variants included in the rules. The game itself is on the more difficult end of game play and doesn’t exactly fit the normal style of most deck builders. I’m not exactly crazy about how new cards are purchased and added to the players hands but it’s not a major deal either. I also wish that there were a few easier scenarios included to help new players get a better feel for the game without feeling so overwhelmed that they might not want to play it again. Fans of deck building games that are looking for a new take on the mechanic and don’t mind a bit of difficulty should enjoy this one. I’d also recommend this game to fans of the Red Dragon Inn series of games. Overall the few minor squabbles that I have with the game don’t detract enough from the overall fun factor for me. I’m sure some people might not like it but I do. For me, the pros heavily outweigh the cons. Give it a try. I recommend it. Just know that there are no drinks allowed on the battle field. For more information about this and other great games, please check out Slugfest Games at their site. This entry was posted in Reviews and tagged battle, battle for greyport, board, board games, card, card games, dragon, games, greyport, heiss, inn, jeff, jeff morrow, morrow, nate, Nate Heiss, red, red dragon inn, sam, Sam Waller, slugfest, slugfest games, waller. Bookmark the permalink.